Hands washing dill and parsley. Greenery floating in water. Time to cook lunch. Eat healthy and live long. Male hands wash asparagus. 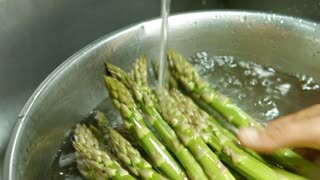 Water pours on asparagus. Delicious greenery full of nutrients. Learn to eat healthy. 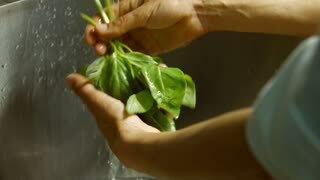 Male hands washing basil. Basil leaves under water flow. Herbs used for cooking meat. Fresh and juicy greenery. 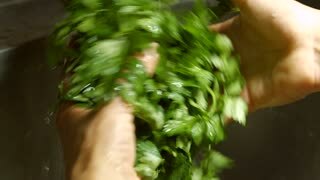 Hands wash parsley and dill. Water flowing onto fresh greenery. 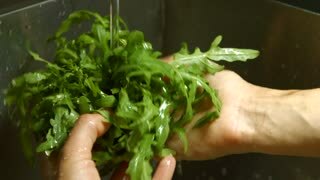 Cook prepares ingredient for salad. Absolute cleanliness neeeded. Hands washing chinese cabbage. 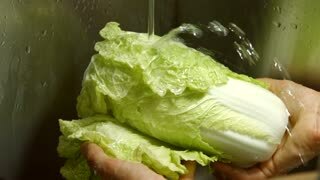 Water pours on chinese cabbage. First stage of preparing salad. 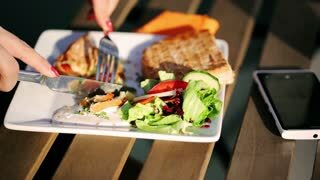 Eat well and stay healthy.